Little Big Town had it right when they released a song called Happy People, because that about sums up their audience, Happy People, you could be in the baddest of moods but when Little Big Town play you can’t help but feel all kinds of happy. The UK Loves Little Big Town – they were a part of the line up for the first ever C2C Festival in 2013 and their performance was unforgettable, it was that good and the UK have become dedicated to their music ever since. After the band having had to cancel their appearance at a country music festival in the UK a couple of years before, I was personally ecstatic to have them at the first C2C and they more than proved their worth of being on the O2 Arena stage. Why do we love Little Big Town so much? Well…one of the things that make this group so loveable and work so well is the fact the group share lead vocals from time to time as well as singing collectively and at times as a duet. Some groups you wonder what the other so -called vocalists do but not with Little Big Town. Whilst Karen Fairchild does tend to do the majority of singing, some of the best songs have been sung by Kimberley such as Sober and the boys always sing tremendously on their solo pieces and it makes their shows so special when you get those individual moments with each member. Another thing , aside from their flawless harmonies and exceptional stand out vocals is their like ability. We fans feel that we know this group, we identify with them, we care for them and we love their individual stand out personalities. Take Kimberley Schlapman for example, is their anyone sweeter in the entire world? We love her sweet southern voice both singing wise and speaking, her adorable ways, her attitude and she just seems like the nicest person who wouldn’t hurt a fly. Then you have Karen Fairchild – her vocals are strong, distinctive, with a rich tone and she has a cool, laid back personality that is very inviting. That brings us to her husband Jimi Westbrook – when these two sing together you can hear why they are so perfect together. Jimi is always smiling and you can’t help but smile with him as his smile is incredibly infectious. Last but certainly not least you have Philip Sweet and sweet he certainly is. Another strong vocalist that you love to hear live, this guy is so friendly and you just want to give him a massive hug. All four members come across as incredibly grateful for their success and for their fans and that is another thing that makes them so likeable, their connection with their audience in both a live setting and in person. 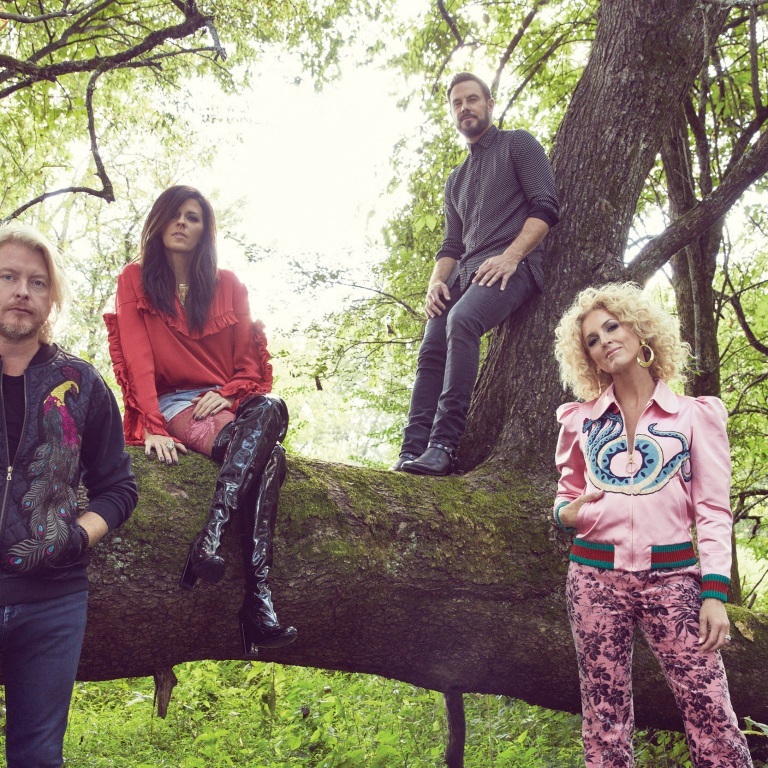 Little Big Town have been quite the success story. Karen, Kimberley, Jimi and Philip have been just about the hardest working group in country music to date. The group have been together since 1998 but didn’t release their first album till 2002 but it wasn’t till their second release The Road To Here that they started gaining some recognition with their single Boondocks (written by all four members and Wayne Kirkpatrick.) This album also produced the stunning ballad Bring It On Home which Philip Sweet takes lead vocal on. LBT seem to always play these songs live still for which I am personally very happy about. Things picked up for the group a bit more with the release of A Place To Land and their more than brilliant singles I’m With The Band and Fine Line. Fine Line is one of my favourites and I wish they played it live more often, however, they did at C2C 2013. The Reason Why was the album that introduced me to LBT – I had heard of them but never listened to their music and then I remember turning on country radio and hearing Little White Church for the first time and becoming obsessed. This entire album is sensational and possibly their best work to date. Shut Up Train is one fantastic song which I have been itching to hear live but hasn’t happened as of yet. From the first song The Reason Why you know the album is going to be a good un’. LBT wrote pretty much the entire album as they did with previous ones which kind of made me sad that their writing met a bit of a decline thereafter. The album Tornado is what really put LBT on the map, sure Little White Church garnered loads of success and was all over country radio but in terms of commercial success, that came when they released the single Pontoon (written by Barry Dean, Natalie Hemby and Luke Laird). A fantastic song and very catchy, this song gave the group a fresher sound and a more youthful edge. The entire album is brilliant with stunning songs such as Sober where Kimberley takes the lead. Sober, a fan favourite is written by The Love Junkies (Liz Rose, Hilary Lindsay and Lori McKenna) a phenomenal songwriting trio whom LBT work with to this day. The heavenly duet Your Side Of The Bed shows us the true magic of Karen and Jimi singing together and this song live is always emotionally beautiful. Title track Tornado also took the band off by storm (pun intend) written by Natalie Hemby and our very own Delta Maid – this song saw so much success on country radio and live, it is very strong winded (yup, intended). Pain Killer took the band even further – with CMA, ACM and Grammy nominations, this band had finally landed everywhere and gave them the opportunity to play huge sell out shows, appear pretty much on every tv show and just got everyone talking. It could be argued that their hit single Girl Crush is what made the album so successful as the song caused a stir and was said to be controversial. Girl Crush allegedly had radio stations refuse to play it due to the songs title being misinterpreted but whether that is actually true or not is another thing – I mean just listen to the lyrics, it is very clear that it is about becoming fixated with a woman who lives the life you want to lead with the man you want to be with. This song was also written by The Love Junkies. Not long after Pain Killer the band took to a side project with Pharrell Williams and released the album Wanderlust. When the single One Of Those Days came out, I wasn’t keen, but the album is actually very good and I was surprisingly impressed. It is very different yes but still good and it was never intended to be country so of course, may not be for everyone. Last year the band released their most recent album The Breaker. With their Taylor Swift penned lead single Better Man putting LBT way up high again, the band have been on everyone’s lips. Better Man has seen many award nominations and wins such as CMA for Song of the Year and a Grammy for Best Country Duo/Group Performance. The band brought over their Breakers tour to the UK late last year and played the historic Royal Albert Hall which is where they announced they were returning to the UK to headline C2C 2018. This will be the bands third time playing C2C Festival but first time headlining and we are very excited. If you have seen Little Big Town before then you know you are in for a treat and that they will end up surprising you even further, if you haven’t then be prepared to be wowed and speechless afterwards as this group are the real deal. LBT have started their US leg of The Breakers tour with Kacey Musgraves and Midland who will also be at C2C. The tour then returns to the US straight after the festival. After that LBT go on tour with Miranda Lambert as part of the Bandwagon tour in the summer.